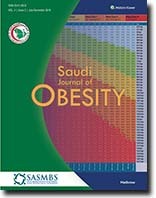 Obesity is an escalating global epidemic with exponential increasing rates in Saudi Arabia and Gulf Countries. Obesity has adverse effects on patients’ health, psychology, and socioeconomic status. In addition, it is a burden on societies when obese individuals become less productive in their work and governments spend more money for their accommodation in the society and health care expenditure. 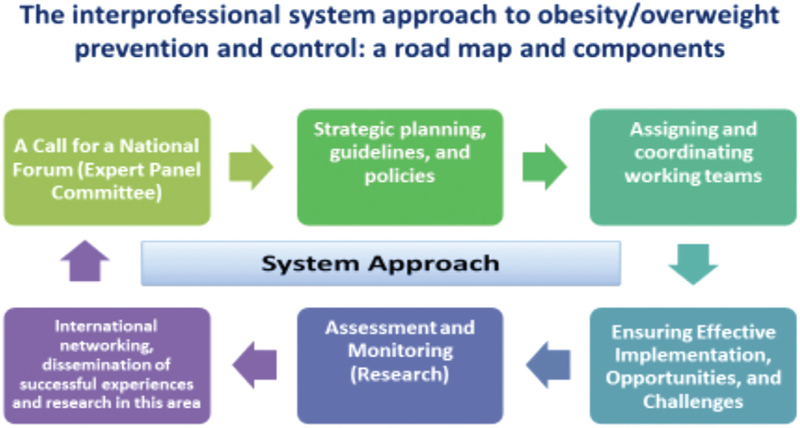 A comprehensive interprofessional system approach inclusive of broad environmental and social interventions and individuals’ psychological and behavioral changes is required to produce positive impact on obesity prevention and control in societies. The aim of this project is to involve concerned health care and non-health professions, policy makers, and other stakeholders to work together within a system framework. The idea of this project was initiated at the first residential meeting of the Manipal University – Foundation for the Advancement of International Medical Education and Research (FAIMER, Philadelphia, USA) International Institute for Leadership in Interprofessional Education (MUFIILIPE) Fellowship Program, Manipal, India, in May 2015. The literature collected and carefully selected includes major reports, policies, guidelines, and interventions done at several sectorial levels; best-evidence practices on communities, health care professions, schools, and workplaces; implementation strategies, success stories, and barriers; and studies on assessment of the effectiveness and impact of these interventions. Out of hundreds of articles and reports in obesity and related NCDs published nationally and worldwide, this project documents and discusses local interventions and programs in this field with lessons learned. In addition, best-evidence practices/interventions, and policies that have worked globally to prevent and manage obesity are discussed and extrapolated to our local settings. Aided by national and international expert groups, this project tries to document a road map for a multisectorial interprofessional system approach to prevent and control obesity in the region to influence its impact on individuals and society. Introduction Majority of data on the association between obesity and increased cardiovascular risk are from studies conducted in western countries with majority of studies being from Nigeria focusing on prevalence in selected populations. The aim of this study was to determine the relationship between obesity and blood pressure (BP), blood sugar, and proteinuria. Materials and Methods This was a community-based, cross-sectional study of 526 adults aged 18 years and older in three local government areas in Lagos. Obesity was assessed using the body mass index (BMI). BP, blood glucose (BG), and presence of proteinuria were determined. Obesity was defined as a BMI ≥ 30 kg/m2, elevated blood pressure (EBP) as a systolic blood pressure (SBP) ≥ 140 mmHg or a diastolic blood pressure (DBP) ≥ 90 mmHg, elevated blood glucose (EBG) as a random blood glucose (RBG) ≥ 200 mg/dL, and proteinuria as ≥2+ proteinuria on urinalysis (≥100 mg/dL). Results The mean age of the study population was 39.2 ± 15.1 years (range 18–83 years) with 51.9% being females. Overall, 116 (22.1%) were obese. The frequency of obesity increased with age and was significantly higher in females (28.9% vs 14.6%; P < 0.01). There was a significant positive correlation between BMI and SBP, DBP, and BG (r = 0.316, P < 0.001; r = 0.316, P < 0.001; and r = 0.245, P < 0.001, respectively). Compared to non-obese individuals, obese individuals in the study were older, more likely to be female, and had eight-fold odds of having EBG and four-fold odds of having proteinuria. Conclusion Obesity is common among adult Nigerians residing in Lagos. Its prevalence is higher in females and increases with age. It is associated with an increased risk of having EBG and proteinuria. Introduction: Obesity is a preventable catastrophic pandemic in developed countries, and its occurrence is increasing in Saudi Arabia. One of the consequences of obesity is infertility, which is prevalent in 9–15% of the population. Objective: To evaluate the impact of obesity on female infertility. Materials and Methods: A retrospective study was performed in 196 infertile female patients of the reproductive age group seeking help in the reproductive unit of King Fahad Medical City, Riyadh. Data regarding age, duration of infertility, cause of infertility, body mass index (BMI), and their fertility outcomes were collected and evaluated using the Statistical Package for the Social Sciences version 20 (IBM Corp., NY). Results: In this study, primary and secondary infertilities were not statistically associated with female BMI, although maximum number of patients was reported in the overweight and obese classification. 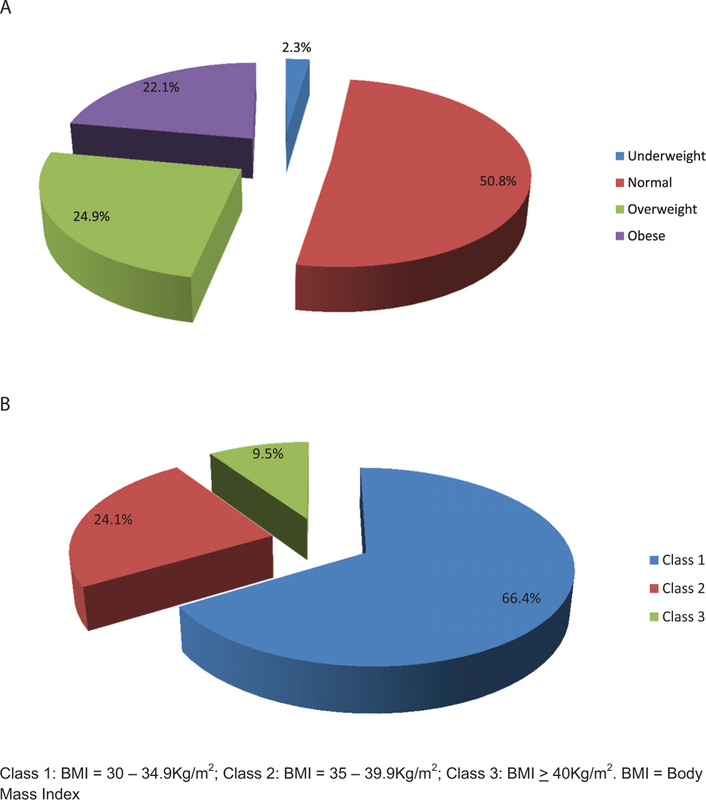 Out of 65 patients in the overweight group, 28 (43.1%) patients with primary infertility and 37 (56.9%) with secondary infertility had BMI between 25 and 29.9; similarly, in the obese group, out of 94 patients, 46 (48.9%) patients with primary infertility and 48 (51.1%) with secondary infertility had BMI between 25 and 29.9. There was overall, statistically significant difference (P = 0.029) between response to assisted reproductive technology and female BMI. Out of the 65 overweight patients, 28 (43.1%) of them and, out of 94 obese patients, 25 (26.6%) of them were pregnant by in vitro fertilization; 29.2% of the overweight and 20.2% of the obese women had successful pregnancy. Conclusion: The likelihood of successful pregnancy among obese women is less compared to normal weight women. Background: Overweight and obesity are growing global health concerns. Strategies to control obesity focus on obesity management and weight reduction as well as obesity prevention. Objective: The objective of this study was to summarize the impact of new nutrition clinic on obesity in Baghdad city, Iraq. Methods: All patients who attended the clinic during the year 2015 were included in this case series study to describe the yield of work of the clinic in its first year. A complete examination was done by the researchers for every patient, including height, weight, BMI, and other relevant examinations according to the underlying health problem. Results: The total number of patients that visited the clinic for the first time was 738 with a mean age of (32.9 ± 9.1 year) and mean BMI of (34.85 ± 7.84 kg/m2). The attendants who reported only one visit formed 71.5%, while 15% achieved two visits and only 13.5% could make it to achieve three visits, 10.5% of the sample did not show any loss in their weight, while 47.4 showed a loss of up to three kilograms after one month, and 42.1% lost more than three kilograms. Conclusion: Most of the attendants to the nutrition clinic are females and morbid obese especially those with hypertension and diabetes mellitus. The compliance of the patients is still low. More health education is needed to increase their awareness about the problem of obesity.